Ignite Kids Club (IKC) offers a winter break camp for both Loudoun County and Fairfax County Public school students, to also include Private Schools (Nysmith, St. Timothy's, and St. Veronica's). Each day is filled with themed and structured activites to included: daily sports, art lab, and technology exploration. The kids will also have ample free time in the gym as well as some fun group games in the game room. Morning and afternoon snacks are provided and we ask that all parents pack a nut FREE lunch. Hours: 7:00 am - 6:30 pm. Register online and choose the number of days you would like to attend HERE! IKC offers a spring break camp for both Loudoun County and Fairfax County Public school students, to also include Private Schools (Nysmith, St. Timothy's, and St. Veronica's). Each day is filled with themed and structured activites to included: daily sports, art lab, and technology exploration. The kids will also have ample free time in the gym as well as some fun group games in the game room. Morning and afternoon snacks are provided and we ask that all parents pack a nut FREE lunch. Hours: 7:00 am - 6:30 pm. Registration opens January 1st! 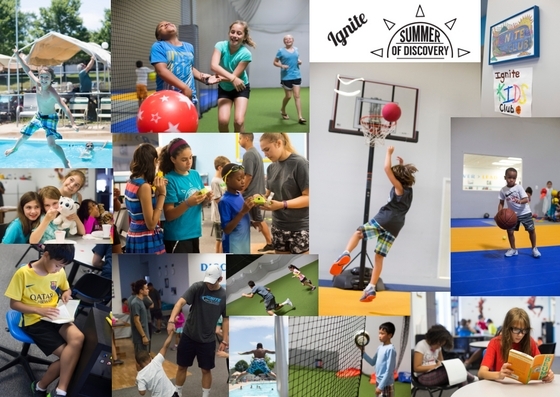 IKC a new and exciting summer camp, Summer of Discovery! Perfect for rising K - 5th grade, each week has a unique theme and includes a field trip, a field day, and a pool day! A side from the exciting trips, the kids have access to our entire facility with structured and age appropriate activities planned for each day. Each week includes a new sport with skill progression and fun games. The kids then participate in team building, group games, technology exploration, and arts/crafts that revolve around our weekly themes. Click here to see a list of our Drop In Camp Days being offered! Our highly trained staff members create an environment that fosters discovery and creativity. Each staff member goes through an extensive training program. We focus on developmentally appropriate instructional strategies. Our staff training extends throughout the year. Staff members are part of Ignite Kids Club planning, training, and program development.